The orangutan is a magnificent sight and then name immediately brings to mind the large ape sitting quietly in a tree or swinging from branch to branch in the tree tops. Some people think there is only one kind of orangutan but it’s not that simple. There are two separate species of orangutan; the Sumatran and the Bornean. They are named from regions they come from and all orangutans are native to Asia. There are several reasons that the orangutan is endangered (Bornean species) and critically endangered (the Sumatran species). The Bornean species are endangered and the Sumatran species are actually critically endangered. In the last sixty years the Bornean population has declined by 50%. The Sumatran orangutan has experienced a decline in population by 80% over the last 75 years. Most of the Sumatran population is found in the Leuser Ecosystem where they had a much larger range years ago. 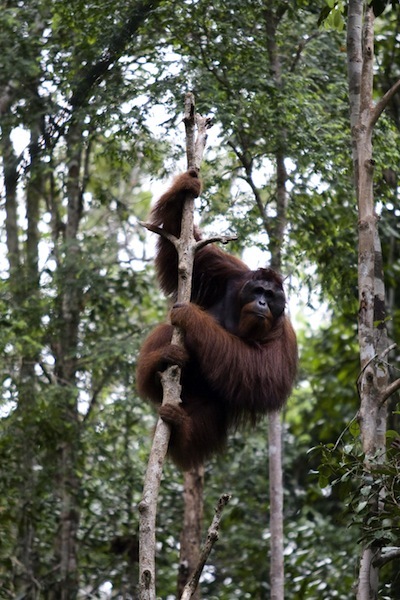 March of 2012 forest fires threatened the last orangutans in the northern Sumatra area. If the fire had reached them the entire population could have been knocked out within days. For the estimates that came in between the years of 2000 and 2003, there were 7,300 Sumatran orangutans. In regards to the Bornean orangutans the estimates came in between 45,000 and 69,000 in the wild. A study from the Indonesian government form 2007 found there to be a wild population of orangutans with numbers higher than 61,000 with over 54,000 of these guys found on Borneo. The Sabah had just over 11,000, the Sarawak had more than 7,400 and the East Kalimantan had almost five thousand. Several decades have not been good to orangutans, seeing their numbers decrease rapidly. A lot of the reason this has happened is forest fires, logging and roads breaking up their areas. One large reason is acres of tropical forest have been torn up to plant palm oil plantations. In addition to this, hunting has become a larger problem for the orangutans than it used to be. They have had their population hit because of the illegal pet trade as well. Many mother orangutans are killed so their babies can be sold as pets and often these babies also die in transit. Many organizations are springing up to help rescue orangutans with the idea to rehabilitate them. One of the largest organizations is the Borneo Orangutan Survival Foundation. This was founded by Willie Smits and works with a number of sizable projects. There are several conservation centers set up in Indonesia and Malaysia as well. Two well-known conservation areas for orangutans are the Matang Wildlife Centre and the Semenggoh Wildlife Centre. One conservation center in particular is choosing to work with the industry for palm oil to get them to be more sustainable and to help establish conservation areas for the orangutans. The Orangutan Land Trust has worked hard at improving this arboreal ape’s future. The famous camp set up in 1971 by Dr. Birute Galdikas and named after the famous paleo-anthropologist Louis Leakey. It was set up as a research center and over the years has supported the efforts of numerous students and scientists alike in their quest to learn more about the orangutans in the wild. The camp is important in the conservation process because it keeps people coming to see the magnificent orangutan in its natural environment. It has also been a station point for the release of rehabilitated orangutans into the wild.